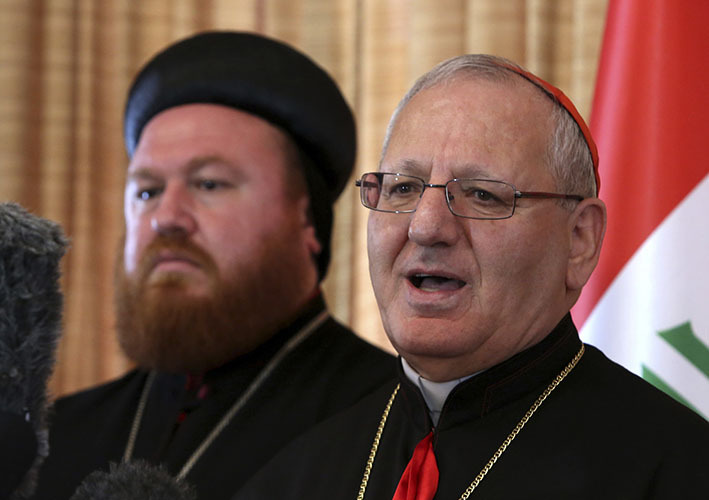 Prayer request: Chaldean Patriarch Louis Raphael I Sako (right) of Baghdad has called for a global day of prayer for peace in Iraq today, August 6, the feast of the Transfiguration. THE leader of Iraq’s largest Christian community has joined with an international Catholic charity, calling for a global day of prayer for peace in Iraq today, August 6, the feast of the Transfiguration. The Transfiguration is one of the 12 great feasts of the Eastern Church – which is why it has been selected by Chaldean Catholic Patriarch Louis Raphael I Sako, who has worked closely with the Catholic charity Aid to the Church in Need in organising the prayer initiative. Patriarch Raphael I, who is president of the assembly of Catholic Bishops in Iraq, called on “all people of good will” to “combine our voices and our hearts before the Lord in order to ask for peace”. In a message issued for the occasion, Patriarch Raphael I expressed his gratitude to Aid to the Church in Need for the role it had taken in organising the day of prayer. “While thanking … the international pontifical foundation Aid to the Church in Need [for the initiative] on August 6, 2014, the feast of the Transfiguration, along with the Christians in Iraq, I [will] unite with all those who raise their hands towards the Lord imploring for peace in Iraq,” he said. In the United Kingdom, Aid to the Church in Need is hoping that parishes will also be praying for peace in Iraq on August 10 – the Sunday following the Transfiguration. Bishop Declan Lang as chair of the Catholic Bishops of England and Wales’ Department of International Affairs, has backed the patriarch’s plea for prayer. “Events in Iraq over the past few weeks have been disastrous,” Bishop Lang said. “Christians have been systematically driven out of Mosul. “A community of 60,000 before 2003 has dwindled over the years and is now down to almost nothing. “For the first time in 1600 years, no Masses are being celebrated in Mosul. In his message Patriarch Raphael I also said: “The feast of Transfiguration is a feast of the transformation of hearts and minds at the encounter with the light of God’s love towards humanity. “May the light of [Mount] Tabor, through our nearness, fill the hearts of all suffering people with consolation and hope. Meanwhile, about 130 people gathered at St Joseph and St Anthony Church, Bracken Ridge, in Brisbane, on Sunday, August 3, to pray for peace in Iraq and other troubled parts of the world. The parish launched an ongoing prayer campaign – pray@8 – and is encouraging others in Brisbane archdiocese and beyond to join in. The aim is for people to stop at 8pm each night in their own homes to be united in prayer. Explaining the campaign at the vigil, Val Smith, a member of the parish’s women’s prayer group said “8pm Brisbane time is about 1pm, lunchtime and a time for prayer in Iraq … and so it’s a perfect time to be united with our brothers and sisters”. “(Parish priest) Fr Gerry (Hefferan) has already informed Archbishop (Bashar) Warda in Northern Iraq of our intention to pray together at 8,” she said. Fr Hefferan said it was important “that the prayer continues with pray@8 with as many people as possible praying”.